Kangaderoo Custom QR Code. : In QR Codes we trust... or not. In QR Codes we trust... or not. Quote from the movie Moulin Rouge : "Without trust, there is no love!" I'm reading a lot of success and failure stories about QR Codes. It all seems to come down to trust and love, or the lack thereof. I can understand that if a tool is utilized and it doesn't bring the wanted result, there is disappointment. 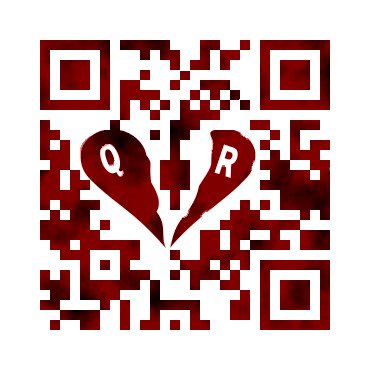 There has to be trust and love for the QR Code with the marketeer that is making it part of its campaign. He/she has to know what the added value of this code can be to the campaign. And the task is to make the integration of the code graphically appealing to generate the correct 'call to action', and make it worth while for the targeted audience to scan the code. There has to be a reward for making the small effort to scan the code from the printed media. If there is no reward, the effort of the user scanning the code will no longer seem small. I've seen remarks that describe scanning the code as a huge task. Most of these mentioned tasks involved picking up the phone, starting an app, etc. These are the task that every smart phone user is doing several times on a daily basis for each of its app. You never hear them complaining that it is hard to start-up angry birds! By branding your QR Code, your code will stand out from the default QR Codes. And if you make good on your promises, using the same kind of branding on future campaign will already have the trust of your audience since the graphical appearance of the code is remembered and more importantly, linked to the good name of your company. For the generation of these specialized and customized QR Codes where the same branding can be copied to a complete range of QR Codes, Kangaderoo is the solution for your QR Code needs. LOL, "You never hear them complaining that it is hard to start-up angry birds!" What direction is your QR Code Heading? QR Codes under a magnifying glass. 4th July celebration QR Code.